Imagine having to ask your boss for permission before getting married. It sounds crazy, but it’s the reality for tens of thousands of Qatar Airways’ employees. A report by the International Transport Workers’ Federation (ITF) claims the airline abuses many of its employees’ basic labor rights, particularly in the case of female workers. The ITF says the terms and conditions in a typical employee’s contract state that women must “obtain prior permission from the company” if they want to get married. It’s not clear what the consequences of tying the knot without getting the green light would be, but based on what happens if you fall pregnant, we’re guessing the outcome wouldn’t be good. Women who become pregnant are required to notify Qatar Airways as soon as they find out. If they don’t, it’s considered a breach of contract. And even if they do speak up — well, they could be fired anyway, according to the report.While labor laws in Qatar might be tough on workers, more than 90% of the airline’s employees are foreigners, which means they don’t enjoy the same work-related freedoms they would have in their home countries. The news follows controversy over a Turkish Airlines policy change earlier this year, which forbade female flight attendants from wearing red lipstick, dark nail polish and silver eye makeup, as well as banning them from coloring their hair blonde or red. The rise of Gulf state carriers continues to impress. These airlines, which have defined themselves in part as hub-and-spoke carriers linking Europe (and the eastern coast of North America) to Asia, have developed exciting route maps over the last several years with a particularly strong reach into the Arabian Peninsula and India. While other airlines have recently attempted to develop their hub airports for intercontinental hub-and-spoke connections as well – Finnair‘s recasting of Helsinki as a northern Europe-Asia hub is one example – the Gulf carriers really stand out in global terms. Yet, awareness of their services remains far lower than it should be among Americans, despite the presence of Emirates, Etihad, and Qatar Airways at a handful of major US airports. The Gulf state carriers’ key consumer product is a luxury flight with premium class service and a truly over-the-top experience on all three airlines. On Emirates, first class passengers are treated to private suites. Etihad’s Diamond First Class features flatbeds, personal mini-bars, and anytime dining, while Qatar Airways’ First Class offers turndown service with an amenity kit including products by Prada. With perks like these, it is clear that these carriers are establishing new standards for premium class service. Even in coach, however, these airlines are delivering a decent product. I experienced the Qatar Airways economy treatment on a recent mid-haul journey from London, via Doha, and back. There was more legroom than in standard coach and the ongoing parade of meals and snacks was, if not exactly delicious, then without question, a cut above average airplane food. Route maps, however, provide the most interesting dimension of the rise of the Gulf state carriers. While there is quite a bit of overlap between airlines, each airline covers some original territory. Let’s look at where these airlines fly.Etihad flies from Chicago, New York, and (as of March 31) Washington, D.C., to Abu Dhabi. Etihad also flies direct routes between most major European hubs and Abu Dhabi, in addition to a few surprising ports of call (Minsk, anyone?). In addition to eight destinations in India, Etihad’s more popular Asian destinations from Abu Dhabi include Bangkok, Colombo, the Maldives, and Seychelles. Qatar Airways links Houston, New York, and Washington, D.C., to Doha. The airline flies to 31 destinations in Europe (including 2012 launches), 12 destinations in India, four in Pakistan, and four in China. Other destinations of note include Zanzibar, Ho Chi Minh City, and Denpasar. Emirates boasts the best links to the US of all with direct connections from Los Angeles, San Francisco, Seattle, Dallas, Houston, and New York to Dubai. Of these, Seattle and Dallas are new routes. The former begins on March 1 and the latter route kicked off on February 2. Emirates’ reach is particularly remarkable. The airline flies to 28 destinations in Europe, 15 destinations in sub-Saharan Africa, 10 destinations in India, and four in Australia; all but a handful of these routes are direct. With beefed up links to major US airports, premium services to lure business and moneyed travelers, and route maps that show no sign of contracting, the Gulf state carriers look set to be important long-haul standbys for some time to come. With the rise of Qatar Airways as a long-haul airline, Doha has become an increasingly easy short-term layover destination. 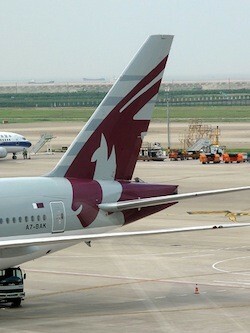 The Qatari flag carrier boasts especially good links between Europe and Asia via Doha. Its route map include a whopping 12 cities in India, three in China, and four in Pakistan; notably, the airline also shuttles European tourists to the Indian Ocean holiday playgrounds of the Maldives and Seychelles. In 2012, Qatar Airways will introduce an additional slate of fascinating destinations, including Kiev, Kigali, Perth, and Zanzibar. Doha’s got plenty of tourism draws, including the renovated Souq Waqif, the Museum of Islamic Art, and its Corniche. Qatar is terribly rich, with the world’s highest or second-highest GDP, depending on the evaluation matrix. As you might expect, Doha’s infrastructure for visitors is undeniably impressive. The city is also in the midst of a major construction boom. The stadiums under construction for the 2022 World Cup alone will keep construction humming through the end of the decade. Since the tail-end of 2010, Doha has been home to Mathaf, Qatar’s Arab Museum of Modern Art. Mathaf’s current show, Cai Guo-Qiang’s Saraab, features 16 impressive commissioned pieces and scores of past works. Guo-Qiang is a major artist, famous for his large-scale projects involving gunpowder and fireworks. He is particularly well known for orchestrating the extraordinary fireworks displays at the 2008 Beijing Olympics’ opening and closing ceremonies. In Arabic, “saraab” means mirage. The exhibition endeavors to explore connections between Quanzhou, Guo-Qiang’s hometown, and Doha, as well as between China and the Arab world more generally. Trade links between Quanzhou and the Arabian Peninsula are not difficult to trace–the former was once the starting point of the Maritime Silk Road–and Guo-Qiang makes the most of this connection. One particularly appealing piece, titled Endless, consists of three boats, one Chinese and two Qatari, sitting side-by-side in a shallow pool, shrouded in mist. The museum, located in a former school building, was revamped smartly by the French architect Jean-François Bodin. Other notable features of the museum include a library with a great magazine selection and a cute café. Mathaf is a good 14 kilometers (about eight miles) from central Doha. The going rate for a taxi from a hotel is 60 riyal ($16.50). Admission to exhibitions costs 25 riyal (just shy of $7) per person. The museum is closed on Monday. Saraab runs through May 26. Book fast – Qatar Airways currently 20 to 25% off their normal business and economy class fares with a limited-time fare sale from the US to over 100 destinations worldwide. Book by November 17 at 11:59 PM and enjoy a six-month travel window between November 21, 2011 and May 31, 2012. Customers can book online, via a travel agent, or in a reservations center. The airline, named Airline of the Year 2011, is ideal for long-haul flights and includes one of the world’s most acclaimed business class cabins. Choose from the airline’s entire array of destinations, including Doha, Kuala Lumpur, Hong Kong, Phuket, Dubai, Seychelles, Maldives, Delhi, Goa, Melbourne, and more.